Egg: Laid singularly on carpet, clothing, fur and museum material. Average hatch in 10 days to 1 month. Larvae: Grow to a size of 5mm and take on average 5 moults (although this can be higher dependent on food availability), and several months to reach their pupal stage. Pupae: Larvae usually pupate in spring inside the last skin of the larvae taking 10 days to develop. 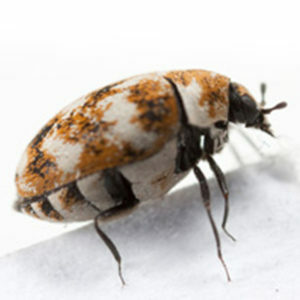 Adult: The adult beetle on emergence seek out light and flower nectar. The adults mate and the females then go in search for suitable materials on which to lay their eggs. The larvae grow to a size of 5mm, having a banded appearance and are covered in short bristles. Adults are 2-3mm in length and are active flyers, they have an orange and black speckled appearance. The larvae are negatively phototaxic and will live exclusively on and in their foodstuffs. The adults are positively phototaxic and will actively fly to find flowers outside the domestic environment. Larvae tend to infest carpets and fabrics which are undisturbed or under compression, behind and underneath furniture. Adults can be seen wandering on the carpet and flying towards light sources. 1. The British Pest Management Manual. Section 5, pg 101. 2. ‘Pest Animals in Buildings, a world review’. Norman Hickin pg 127.